We wake up to some mighty cold weather and sadly, no hot water. After packing, checking our goodies and making sure we have easy access to our passports, we head off towards the train station. Francois has our train tickets and luckily we are both close to the station and he set it up as a destination on the GPS last night. We arrive approximately 15 minutes before our train is set to depart, but as we look at the “Departures” board, our train is not on there. In fact, there is no train to Chambéry from this station… we’re obviously at the wrong station, with 10 minutes before our train leaves the platform. The realization sets in that we cannot afford to miss this train, and we run out of the station straight to a waiting taxi. The driver must’ve had some experience with people emulating contenders on The Amazing Race, and he has the car ready and loads our bags in record time. Without waiting to hear where we are headed, he starts the car up and heads towards the station exit. We show him our tickets and emphasize the departure time. He nods in understanding and races us to the other train station in Turin, a mere two kilometers away. We meet the train and gratefully (though panting and breathless) sit back in our reserved seats, finally on our way to France. We wind through the amazing landscape and as the train snakes through the mountains, it is under the cover of thick fog and light snow. Francois and I are like small children, staring out the window at what can only be described as a wonderland. Arriving on the train station in Chambéry, we start looking for a bus or metro train that connects the train station to the airport from where we need to collect our rental car, about 10 kilometers from the station. After much debate (and now having to not-understand people in yet another language), we figure out that there is no bus or train line to the airport. So, two taxis in one day it is, then. The airport is tiny. Miniscule. Ridiculously small. It’s an airfield, with converted shipping containers for offices. The taxi driver looks at us a little dumb-founded (as there aren’t any planes), but off loads us none the less and points us in the direction of the rental car offices. We walk in to find about eight rental car agency desks, though only one is manned by a slight French woman. We explain in a mixture of English and newly-acquired-Italian that we’re looking for a representative from Europcar, and eventually she calls their offices. She hands the phone to me and I am confronted by an angry-sounding Frenchman, accusing us of not booking a car. I assure him that we did, give him our reference number and he inquires as to why we booked a car from the airport, when we arrived by train. I tell him that their website only showed the Europcar at the airport and he changes his attitude and assures us that he is bringing our car to us. He arrives in a huff and apologizes profusely. He refunds us the cash we’d spent on the taxi to get to the airport and very deftly handles our contract. We receive the keys to a tiny Renault and are off on our way to Chamonix Mont Blanc. 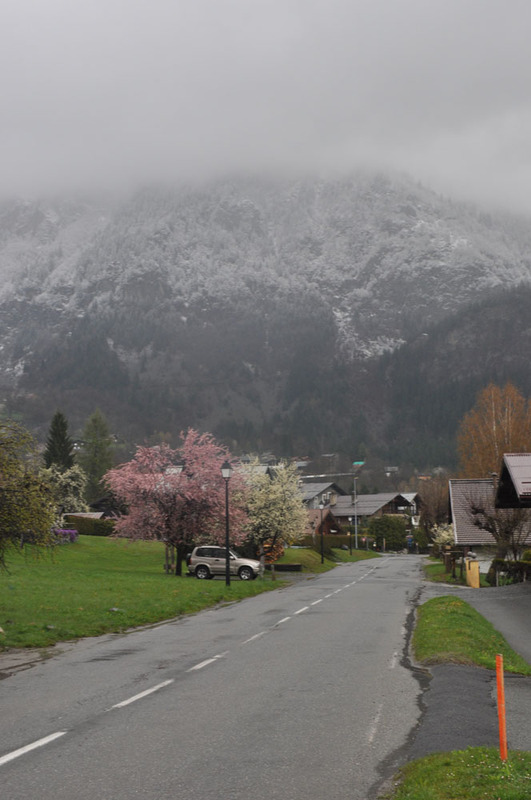 Driving from Chambéry, we watch as the temperature drops as we close in on the Alps. Accommodation in Chamonix itself is very expensive (due to all the skiers), so we are staying in the next village over, Passy. After checking into our rather quaint hotel rather high up the mountain, we get our “we’re seeing snow” today faces (and gear) on, and hop in the car to Chamonix. 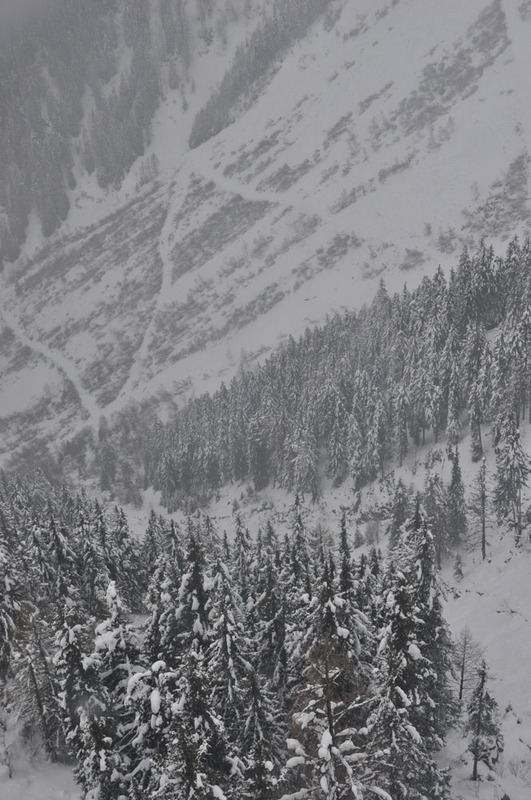 The temperature drops even further, and as we arrive in Chamonix it is 0ºC. The mountains are all covered in mist, but it only adds to the effect of having an all-white landscape surround us. 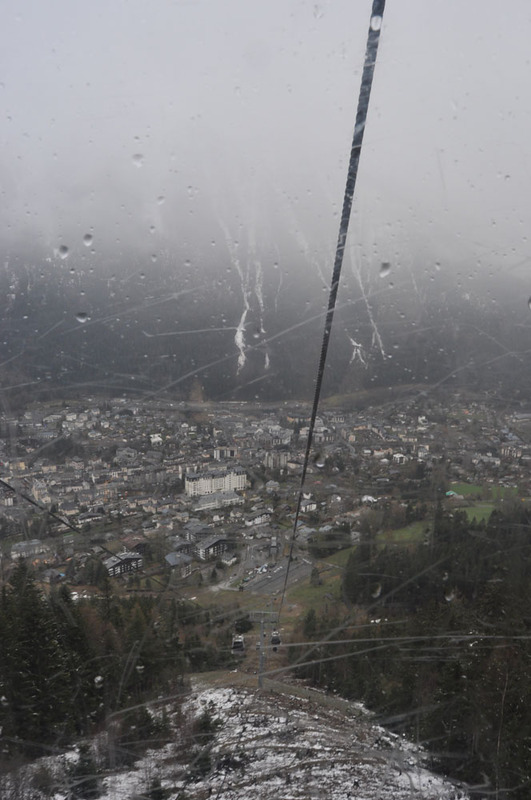 There are a number of cable-cars and -lines in Chamonix so after enquiring as to which ones are operational, we buy our tickets and head up the mountains. As soon as we depart the ground station, I have an insane feeling of trepidation and excitement build as we enter the fog and lose visibility of Chamonix and anything more than 50 meters away. 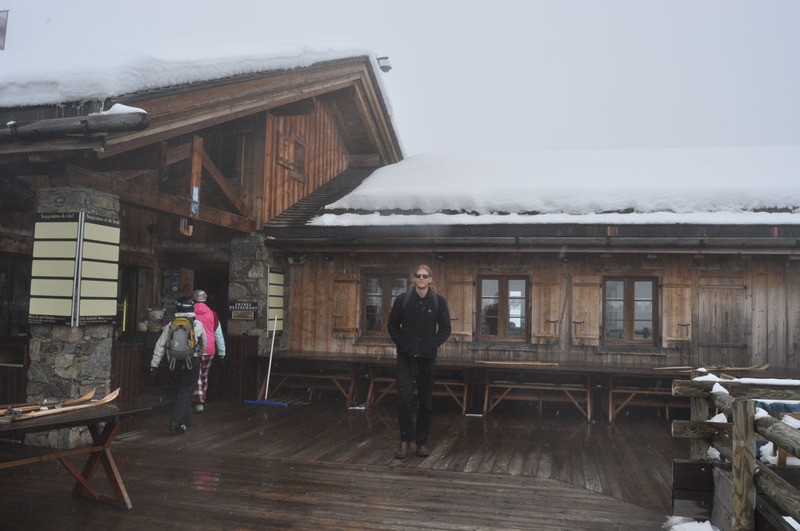 The first stop is at 1800m. It feels warmer than in Chamonix, but is ghastly white. Francois and I run around in the snow and make scrunching noises as we walk. The skiers look at us with dubious eyes and obvious judgment, but coming from sunny South Africa, we don’t care. Before we depart to continue our ascent, we make snow angels on one of the banks. The cable car winds further up the mountain and the next stop is at 2500m. We get out and are immediately blasted with a freezing wind and swirling snow. When the wind isn’t blowing, it is deathly quiet and feels as if you’re inside a huge ball of cotton wool. There really isn’t much to see this high up other than snow and wind, and we head back down to our previous stop to enjoy a (VERY) expensive cappuccino. Back in Chamonix we get something for dinner and some more medicine from the pharmacy, as we’re now both officially sick with flu. We plan on coming back tomorrow morning, to take the train du Montenvers up the mountain to the Mer de Glace glacier and ice cave. 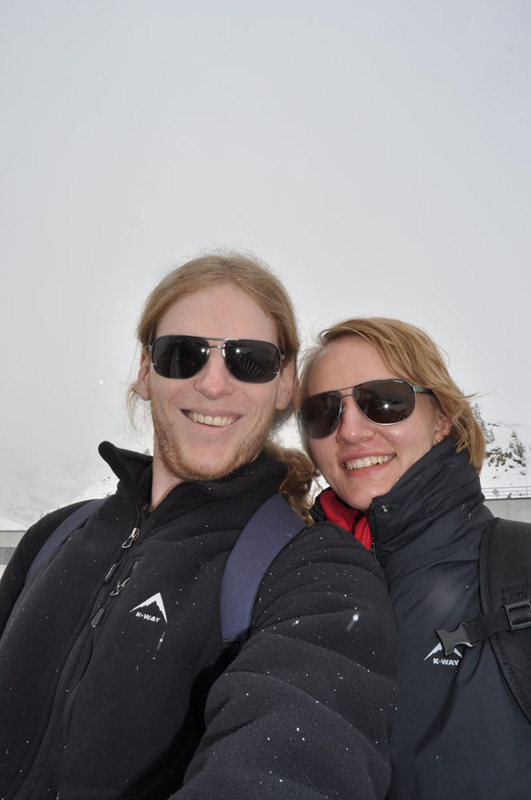 Continues in part 8 with our visit to the glacier and our stay in Annecy, France. this is really a cool report and love the photos! Thanks very much! Keep following the posts, we only left Europe on the 30th April from Amsterdam – so a lot of news still to come.